Was Zarqawi In Fallujah During The 2nd Battle For The City? On October 13, 2004 Interim Prime Minister Iyad Allawi demanded that the city of Fallujah turn over Abu Musab al-Zarqawi or be attacked. At the time, it was widely held that the leader of Tawhid wal Jihad was within Fallujah and was using it as his command center. That is still believed today. Tawhid was definitely within the city, but was Zarqawi? According to several leaders within the organization he was not. According to two leaders of Tawhid wal Jihad, and a religious leader from Fallujah, Zarqawi was outside the city during the entire Second Battle of Fallujah. First was Abu Anas al-Shami a member of Tawhid wal Jihad’s central command and a leader within Fallujah. (1) Shami wrote that Zarqawi wanted to be in the city to fight the Americans, but his followers told him not to. Next was Abu Azzam al-Iraqi who was Tawhid wal Jihad’s emir for Fallujah. He sent daily reports on the progress of the battle through a courier who travelled by river to where Zarqawi was. Then there was Abdallah al-Janabi one of the main religious leaders in Fallujah who helped run the city. He repeatedly said that Zarqawi was not there. While Janabi might have been trying to save his home from attack, that was not the case for Shami and Iraqi. There was no reason for two Tawhid wal Jihad leaders to claim their leader was not in the city in their personal correspondence and diaries. It would appear that while Tawhid wal Jihad definitely took part in the Second Battle of Fallujah, Zarqawi could have very well been an observer from the outside. Roughly three months after Fallujah was freed the first families have begun returning. In a carefully orchestrated event by Anbar politicians, 14 families were welcomed back on September 14. There were three other families, but at the last minute they were declared Islamic State sympathizers and rejected. People are supposed to go through five different agencies to get authorization to enter Fallujah, but that process appeared to be still a work in progress. Two days later Anbar Governor Suhaib al-Rawi said that 40 families were back. The mayor of Fallujah claimed 500 had returned, but that was a bit of an exaggeration as that included the surrounding towns. These families are facing a similar situation as in Ramadi. Like that city there are still unexploded bombs in large sections. There are also no services like running water or electricity. The government did provide water tanks and dried food. Despite that families interviewed by the media were ecstatic about being in their homes. Some were damaged, some had been occupied while they were gone, but being back was a joyous occasion. The authorities need to balance the desire of people to return, their security, and their living conditions. Some families fled Fallujah in January 2014, so they have been waiting a very long time, and must be putting immense pressure on politicians to go back. 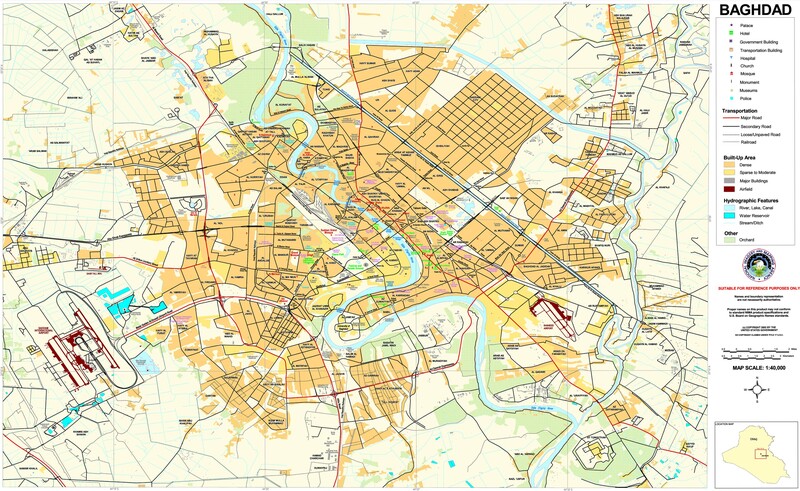 Only parts of the northern section of the city have been cleared of bombs, and that was where all the families were settled. A similar situation occurred in Ramadi when people were allowed in before it was fully cleared and around 100 people ended up dead and wounded as a result. There is also the issue of reconciliation as the Islamic State left behind a lot of resentment and mistrust against those that worked with the militants. Those people are not supposed to be allowed back, but three of those alleged families almost got in on the first day. Hopefully the government has learned from that fiasco, but you never know. 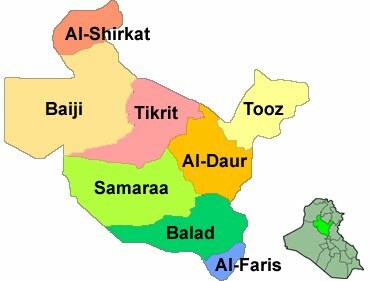 Finally, there is nothing in Fallujah but the people’s domiciles. There are no services, jobs, businesses, etc., and it will stay that way for the foreseeable future. That’s because the government has no money to rebuild Fallujah because of its budget deficit. These are the dilemmas facing all the every areas of Iraq, and there are no easy resolutions to them. 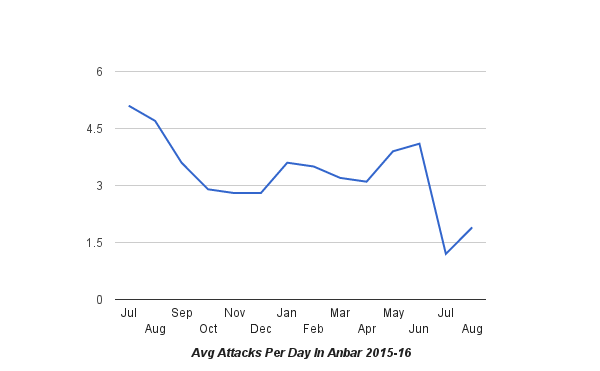 The third quarter of 2015 saw a big surge in violence by the Islamic State before a large drop off during the winter. 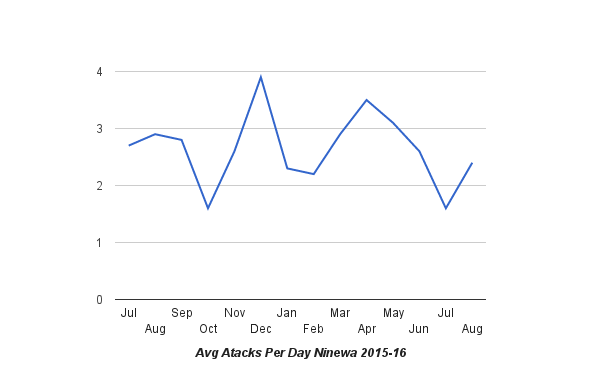 Baghdad, Kirkuk, Ninewa, and Salahaddin all saw increases in security incidents, while Anbar witnessed a drop, and Diyala was unchanged. 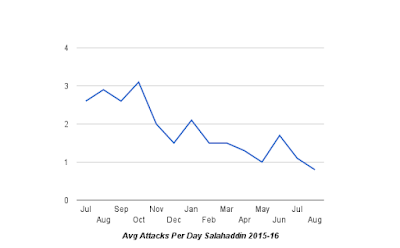 There were a total of 2,042 security incidents recorded from July to September 2015. That averaged out to 22.1 incidents per day. This burst of violence was almost all due to attacks by the Islamic State rather than fighting during government led operations. After that surge in the summer there was a large dip in the winter. For the last quarter of the year there were 1,796 incidents, averaging out to 19.5. 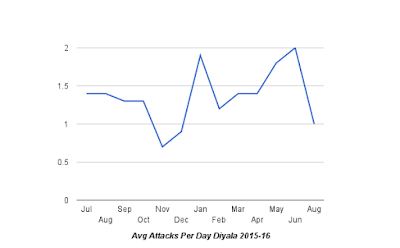 That was due to a large drop in attacks in October and November, before going back up in December and January 2016. 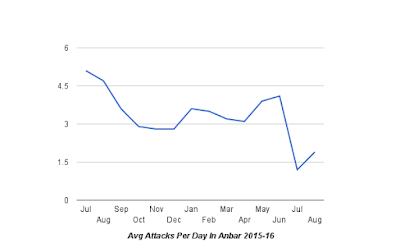 Anbar was the only main battlefront that saw a decline in incidents in the third quarter of 2015. They went from an average of 5.1 per day in July to 4.7 in August to 3.6 in September. The government was busy trying to clear the areas around Fallujah and Ramadi and the towns in between, but the Islamic State didn’t seem to take them seriously otherwise there would have been a large number of counterattacks. The violence was still intense with 57 car bombs and 6 suicide bombers. That meant the province was still one of the deadliest in Iraq. From July to August 1,526 were reported dead, and 1,418 wounded. Government shelling and Iraqi and Coalition air strikes led to 511 fatalities with another 747 injured. The fact that there were more dead than wounded recorded in this period was another sign that the authorities were suppressing casualties. 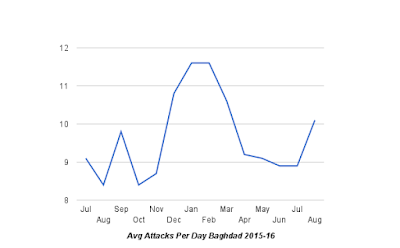 Violence went up and down in Baghdad. 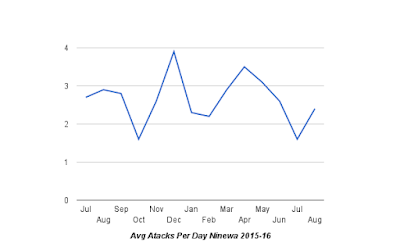 There were 9.1 incidents in July, going down to 8.4 in August, only to increase to 9.8 by September. That was a prelude to the huge increase in incidents that would be seen in the 2015-2016 winter when there would be an average of 10-11 incidents per day. That highlighted the shift in emphasis by the Islamic State from conventional fighting to terrorism that would continue into the next year. At the same time, the militants either lost resources or shifted them to other theaters as there were 21 car bombs and 4 suicide bombers in July, going down to 11 in August and 7 in September along with 3 suicide bombers. There would not be 21 car bombs in Baghdad in one month again. 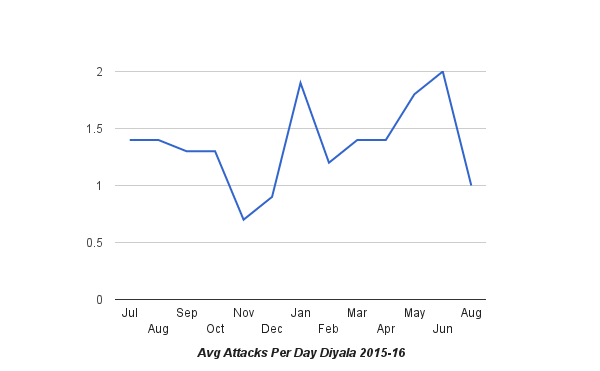 Diyala never really saw as much violence as the rest of the country after the insurgents’ summer 2014 surge. In the 3rd quarter of 2015 there were just around 1 incident per day. Most of those were shootings and IEDs, but the Islamic State was trying mass casualty bombings a couple times a month. In July for example, there were 6 car bombs including one in a market in the middle of the month that caused 285 casualties. That was followed by 5 more car bombs in August, with another in a market leaving 130 dead and wounded. Finally, in September there were 3 vehicle bombs. 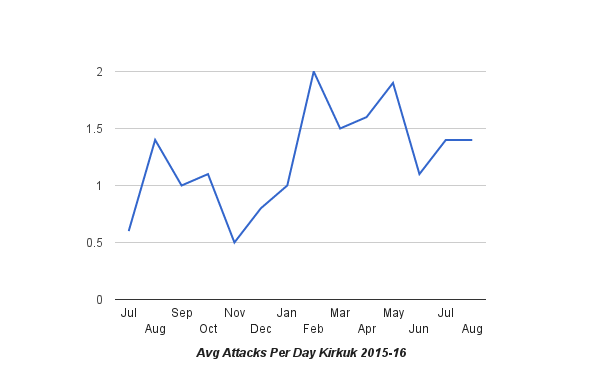 There was a slight surge in activity by the Islamic State in Kirkuk from July to September. 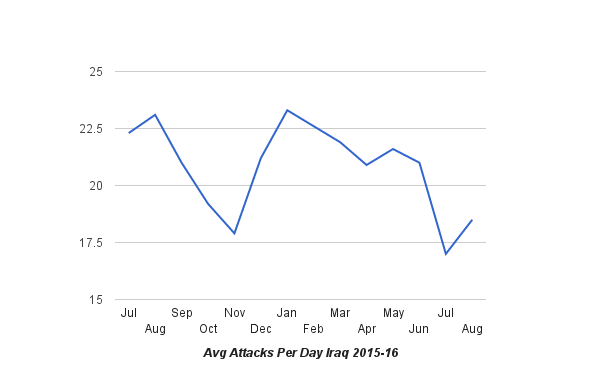 Incidents went from 0.6 per day in July to 1.4 in August to 1.0 in September. Violence then fell off in the winter to pick up at the start of 2016. Most of those incidents were skirmishes with the peshmerga. IS was also executing a large number of people in Hawija, which is the last district in the province still under its control. 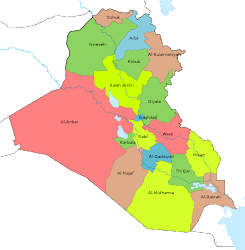 Ninewa was different from the other governorates in Iraq because many of the reported incidents were executions by the Islamic State. It as difficult to ascertain whether all of these actually happened or whether they were propaganda as they mostly came from Kurdish papers connected to the ruling parties. At the same time, residents, people who have fled, and IS’s only propaganda have shown their harsh punishments for breaking their rules. 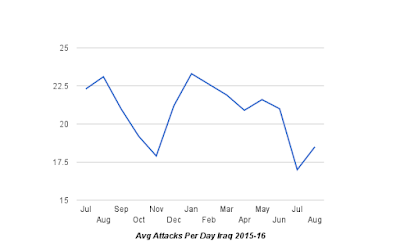 From July to August a total of 1,876 were killed, and 247 wounded. 1,407 of the fatalities were executions. There were also 160 people found in mass graves. Another 204 were reportedly killed in Coalition air strikes, and 167 injured. There were also occasional attacks upon the peshmerga lines. 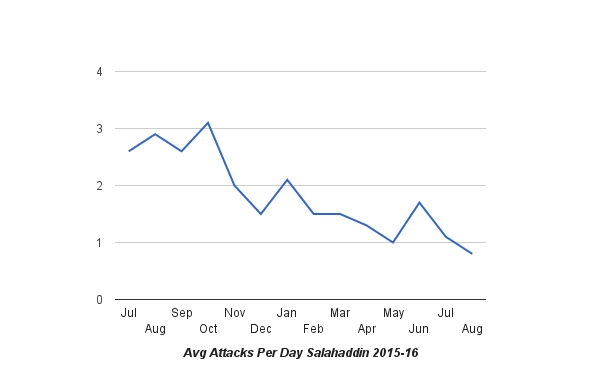 The number of attacks in Salahaddin were pretty much flat from July to September. There were an average of 2.6 per day in July, 2.9 in August, and 2.6 in September. Most of those took place in Baiji and its refinery. During the quarter, the government forces consistently claimed they had almost freed the area, only to launch a brand new operation immediately afterward. Most of the victorious announcements were propaganda by various Hashd groups. For example, in July one of the main Hashd spokesman claimed that 80% of the refinery was freed and then two days later Asaib Ahl Al-Haq said only 40% was cleared. It wouldn’t be until October that the town and facility was finally liberated. After that attacks in the province would steadily decline up to the present day with only a few brief spurts of insurgent activity. During the quarter two car bombs were dismantled and destroying in Karbala. Otherwise the Islamic State carried out no attacks in all of southern Iraq. What violence that was reported in that region was political, criminal, or tribal in nature. With Mosul Threatened And The Caliphate Collapsing In Iraq What’s Next For The Islamic State? In the August 2016 edition of Perspectives On Terrorism, Naval War College, Monterey Professor Crag Whiteside tried to give an overarching framework for the Islamic State’s history. Whiteside argued that IS can best be understood as a revolutionary group following the general principles of Chairman Mao Zedong’s people’s war of building, expanding, and then directly challenging the state. Chairman Mao outlined his ideas about revolutionary warfare based upon his overthrow of the Chinese government. Mao wrote that a people’s war is a protracted political-military struggle based upon irregular units attempting to take over the state. This goes through three broad phases. The first is the building and preserving stage, then the expansion, and finally the decisive phase when the state is directly challenged and overthrown. These three steps are not set and based upon local conditions and the strength of the government. It is also a long and drawn out war based upon recruiting and indoctrinating cadre, gaining support of the population, and carrying out synchronized political, economic, social, and psychological moves, not just military ones. Terrorism was considered an integral part of the people’s struggle as it was used to undermine society and the authority of the state, not to defeat the enemy or acts of desperation. The Islamic State adopted Mao’s ideas via the Syrian Abu Musab al-Suri. Suri was a leader amongst Syrian jihadists and went to Afghanistan to fight in the war there. His book, Global Call for Islamic Resistance which documented previous jihads including the one against Hafez al-Assad was widely read in Islamic circles including by Abu Musab Al-Zarqawi. Suri talked about a revolutionary jihad and recited Mao although not explicitly. Many of Suri’s ideas of creating a centralized and compartmentalized political-military covert organization were incorporated by Zarqawi into his Tawhid wal Jihad that would later become Al Qaeda in Iraq and the Islamic State. From 2002-2005 Zarqawi entered into Mao’s first phase of building his group. Zarqawi started off with a very small group of foreign fighters. 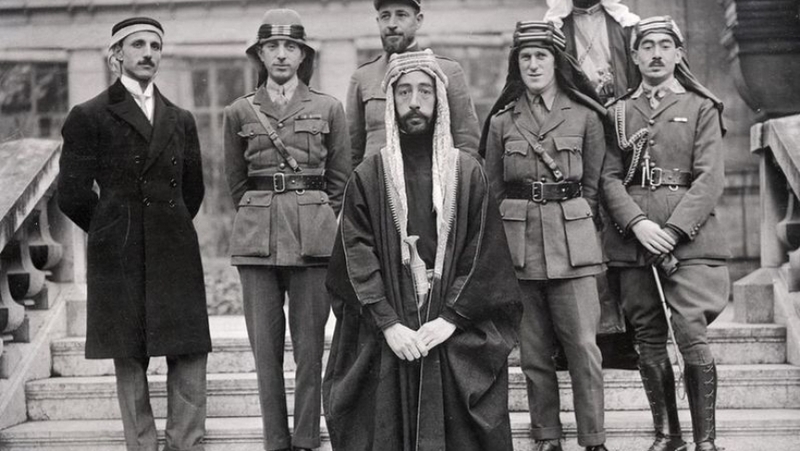 His first goal was to expand and take over the Iraqi insurgency, which consisted of Baathists, nationalists, and rival Islamists. Zarqawi came up with 5 tactics: weaken the Iraqi government, recruit rival groups, play and expand upon Sunni alienation with the new Iraq, provoke Shiite militias, and convince the United States to withdraw. He also incorporated Mao’s ideas of terrorism focusing upon headline grabbing bombings in 2003 rather than small skirmishes and improvised explosive devices as other groups were doing. His first actions occurred in August 2003 when Tawhid wal Jihad bombed the Jordanian embassy and the United Nations headquarters in Baghdad, and the Imam Ali Mosque in Najaf. As Mao argued these attacks were not meant to overthrow the U.S. occupation, but they undermined the victory narrative Washington was pushing after the overthrow of Saddam, and made the U.N. and other international groups and foreign countries weary of operating in Iraq. By 2004 Zarqawi moved to targeted assassinations with specific units carrying them out against militiamen, Iraqi Islamic Party members, politicians, judges, and senior members of the Iraqi Security Forces (ISF). At the end of the year, Zarqawi aligned with bin Laden and changed the name of his organization to Al Qaeda in Iraq adding the prestige of that group to his own, and opening up new revenue sources from international donors. Mao also spoke of using contradictions in society to mobilize the populace. Zarqawi used sectarianism to rally Sunnis to his cause. He attacked Shiites to provoke their retaliation so that he could portray his organization as the protectors of Sunnis, and helped lead to the Sunnis boycott of the 2005 elections that further alienated the community form the new political order. Finally, Zarqawi recruited Iraqi Salafis that had grown up under Saddam. Under this first phase Zarqawi was widely successful. He became the brand name behind the opposition to the U.S. occupation even though he was not an Iraqi and his group was very small. He completely undermined the Americans initial plans for Iraq by spreading violence and creating a non-inclusive government, while forcing the U.N. and other organizations to withdraw from Iraq at least temporarily. In the next step he and his successor were not as successful. From 2005-2007 Zarqawi and his successor Abu Omar al-Baghdadi expanded Al Qaeda in Iraq, but faced a massive pushback from the country’s Sunnis. In 2006, Al Qaeda in Iraq created the Mujahadeen Shura Council to bring in other insurgent groups. 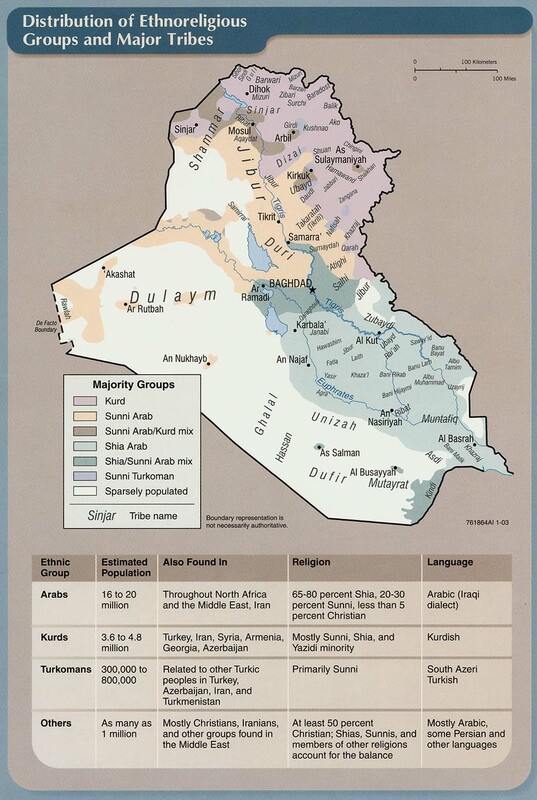 Later that year the Islamic State of Iraq (ISI) was announced. At the same time Zarqawi was killed in an American bombing. He was replaced by Abu Omar al-Baghdadi whose plan was to appeal to Iraqis, increase the military campaign, build the group’s organization, and become self-sufficient financially. Zarqawi and Bahgdadi however, emphasized the military effort more than politics, which created a backlash. While the group was expanding its operations across the country, it was forcing its ideas upon the populace rather than winning them over. The result was the Anbar Awakening and the Sahwa that started in 2006 and quickly spread across central Iraq in 2007 thanks to the support of the Americans. 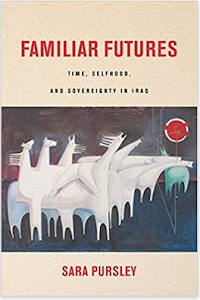 Those two incorporated not only Sunni tribes, but other insurgent groups that had grown tired of ISI’s violence, attempts to change Iraqi culture, and heavy handedness. Together the Awakening, Sahwa, and U.S. were able to push ISI out of most of its strongholds, and the group had to retreat. 2008-11 ISI returned to rebuilding under the leadership of Omar al-Baghdadi. At the time, many thought that ISI was down and out, and the insurgency was in its death knell. Instead, Omar al-Baghdadi came up with a detailed and effective plan to get rid of rivals and co-opt others to gain back its base. The main target was the Sahwa and tribes that had cost it so much. Its “Strategic Plan for Reinforcing the Political Position of the Islamic State” said that the organization’s problems were due to the Awakening and Sahwa, and the Americans turning the tribes against them. To rebound, ISI would mimic the U.S. tactics and win back these groups by playing divide and conquer. Sahwa leaders and sheikhs would be offered rewards for their cooperation, and those that refused would be assassinated. At the same time, ISI planned to take advantage of the U.S. withdrawal in 2011. It would work to recruit other insurgents groups, would target the ISF hoping to drive it from areas to open space for the militants to operate in, and launch a new wave of terrorism to put it back in the media hoping to gain new recruits and backing. In the summer of 2009-10 for example, it carried out a series of massive bombings in Baghdad aimed at Iraqi ministries. The Americans unwittingly helped as well by releasing 20,000 prisoners that included much of the group’s current leadership. Finally, it worked at proselytizing amongst Iraqis rather than forcing its ideas upon the population like it had before. Omar al-Baghdadi would be killed in 2010, but what he set in motion would succeed in bringing ISI back from the dead. ISI’s new leader Abu Bakr al-Baghdadi guided the group through its next phase the second expansion from 2011-2013. Baghdadi stepped up the campaign against the Sahwa and ISF. Many histories of the Islamic State argue that the group rebuilt itself in Syria and then expanded back into Iraq. In fact, ISI was already in the rebound in Iraq and took advantage of Syria to expand and recruit. The boldness of the group was marked by the 2012 Breaking Walls campaign that carried out prison breaks to release members, stepped up its terrorist bombings, and retook areas it had lost. 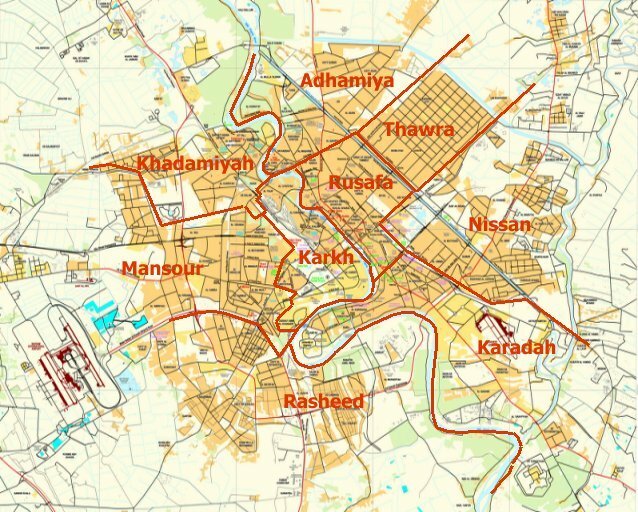 These events marked Iraq’s return to a full-fledged insurgency. That allowed Baghdadi to move into phase three decisive action for the first time starting in 2013. That year Baghdadi claimed that he had formed Al Nusra Front in Syria and then moved more directly into that war leading to the new name the Islamic State of Iraq and Syria (ISIS). The Soldiers’ Harvest campaign was launched in Iraq aimed at attacking the ISF and seizing territory. ISIS then took over Fallujah in early 2014 after tribes and other insurgent groups rose up against Prime Minister Nouri al-Maliki when he shut down the Ramadi demonstration site. That culminated with its summer offensive, which swept through Mosul, Tikrit, Hawija and western Anbar. Baghdadi then announced the establishment of the caliphate, which brought it support from around the world. While it hadn’t overthrown the Iraqi government, it had created one of its own stretching across western and northern Iraq into neighboring Syria. At the same time, the Islamic State as it then became known expanded far past its capacity. IS seemed to be riding high with its caliphate, but it was actually heading for a fall that would return it to the first stage of rebuilding once again. As soon as Baghdad recovered from its collapse in northern Iraq and received the assistance of first Iran, and then more importantly the United States and its coalition the tide against IS would slowly turn to near collapse in Iraq. 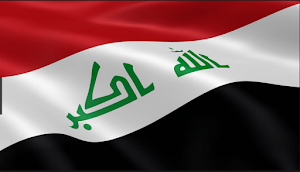 While IS would have one final victory when it took Ramadi in the middle of 2015, after that the group would face defeat after defeat in Salahaddin, Anbar, and Ninewa. Today, Mosul is on Baghdad’s hit list and could be attacked this year. Many of the group’s main leaders such as spokesman Abu Mohammed al-Adnani have been killed in air strikes. The group has seen the writing on the wall, and is preparing to return to an insurgency once again. Before his death, Adnani issued a statement in May 2016 saying that IS might lose the land and cities it controlled and return to the desert, but it would not be defeated. What that foretold was that IS was ready to withdraw and fight another day just as it had after facing its previous greatest setback at the hands of the Awakening, the U.S. Surge and Sahwa. The outlines of that strategy are already apparent with its terrorist campaign in Baghdad. Again, this is part of a political, military and propaganda effort to show that the group is still capable of operations despite its territorial losses, and to challenge the authority of the government. 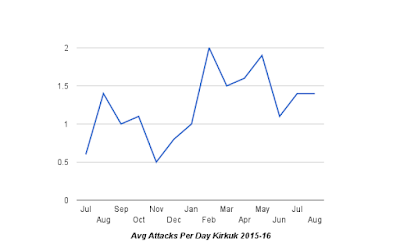 The effectiveness of these attacks was shown in the summer of 2016 with the Karrada bombing that left over 500 casualties. There was wide condemnation of the authorities and Iraqi forces afterwards for letting such a catastrophe occur, highlighted by another car bomb in that same neighborhood a few weeks later. At the same time, IS is rebuilding in the rural areas and attempting to win back the tribes that they have once again lost the support of. That can be seen in IS attacks upon the Ramadi, Fallujah and Tikrit districts, which have all been freed over the last year or so, but the militants have been able to re-infiltrate. 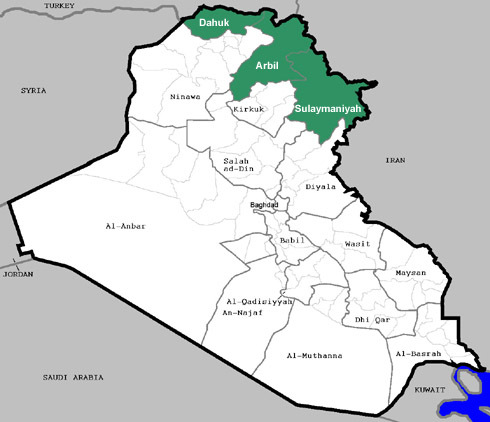 IS also has bases in Diyala and the rural towns in Baghdad to build upon. The reprisals the Hashd and Peshmerga have carried out on Sunni civilians and towns, the lack of money to rebuild, and the political battles for control of the freed areas provide other avenues for IS to exploit. Throughout its history, the Islamic State has shown great adaptability, which is why it has survived for so long. Mao wrote that when the enemy is strong the guerrillas retreat, and look for weak points to exploit. That is what IS is doing now as it attempts its third rebuilding effort in Iraq. It is quickly giving up territory hoping to fight another day, while increasing its terrorist operations. It may never have another caliphate, but that wont stop it from being a deadly insurgent force hoping to re-emerge and expand once more when the opportunity presents itself. As Mao noted, a popular war is a protracted one with ebbs and flows, and the Islamic State is in it for the long haul.